This article covers the gamut from triage and emergency assessment, initial stabilization, physical examination, diagnosis, surgical and/or medical therapy, and monitoring of the patient. 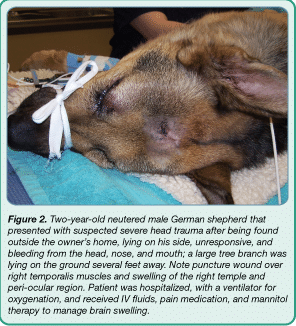 Although animals with head trauma are frequently presented to emergency hospitals, veterinary teams at general practices encounter these patients as well. Therefore, understanding triage and emergency assessment and treatment of head trauma is important for every veterinary professional in practice. Head trauma often results from falls, gunshot wounds, car crashes, and altercations with other animals. 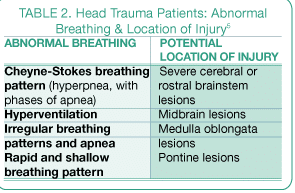 When assessing a head trauma patient, it is helpful to understand the differences between primary and secondary head injuries. Primary head trauma immediately follows impact and consists of direct damage to the brain parenchyma, such as contusions, lacerations, and diffuse axonal injury. 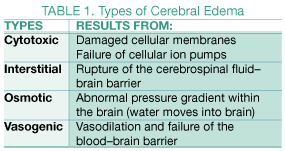 There also may be damage to blood vessels in the brain, which can cause subsequent intracranial hemorrhage and vasogenic edema (Table 1). During assessment, check circulation, including evaluation for pulse deficits, hypovolemia or dehydration. Do not forget pain—the fifth “vital sign.” Addressing pain provides some relief to the patient and aids in the recovery process. Increased blood pressure can cause alarm because it may be caused by an increase in intracranial pressure, especially if accompanied by bradycardia. However, pain may be the underlying cause of hypertension and should be assessed and managed during stabilization. Establish IV access and assess blood pressure; then consider administering fluids while the patient is being stabilized. The goal of volume resuscitation with colloids or hypertonic saline is to achieve a mean arterial pressure (MAP) of 80 to 100 mm Hg (or 120–150 mm Hg systolic). Cardiovascular support is important because cerebral perfusion pressure depends greatly on MAP. In particular, if intracranial pressure increases, this support is critical. Assess oxygenation via pulse oximetry or arterial blood gas analysis. Keep in mind that, even if the patient is not cyanotic, it may be unstable and hypoxic.4 SpO2 levels (percentage of hemoglobin in blood saturated with O2) should be greater than, or equal to, 95%. Accidental displacement of fractures and/or exacerbation of spinal injuries by failing to be careful when manipulating the head and neck. Pressure on, and blood collection from, the jugular vein, both of which can decrease venous return from the brain, which increases intracranial pressure. Examine the patient’s eyes, which provides a multitude of information, including severity of brain injury. Strabismus and nystagmus: If strabismus is present, the cranial nerves or brainstem may be damaged. 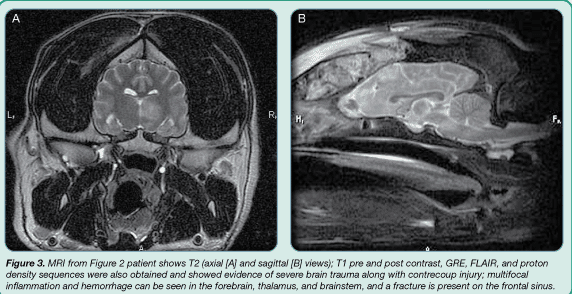 If physiologic nystagmus is absent, severe brainstem damage may be present. However, lack of physiologic nystagmus in a comatose patient does not necessarily indicate brainstem damage. Pupillary light response (PLR): A slow PLR usually indicates a guarded to poor prognosis; an absent PLR indicates a grave prognosis. Pupil size and behavior: Pupil size, along with PLR, can help evaluate a patient’s status and prognosis. Miotic, or “pinpoint,” pupils usually result from cerebral injury or edema, and indicate a guarded to fair prognosis. Mydriatic pupils can indicate stress, ophthalmic disease, and use of certain medications, such as atropine. In rare circumstances, they may indicate impending cardiopulmonary arrest. 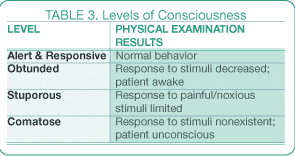 Unilateral, then bilateral, unresponsive mydriatic pupils (bilateral being worse) indicate a poorer prognosis than miotic pupils per the Modified Glasgow Coma Scale. Anisocoria often signals oculomotor nerve damage or compression, direct eye injury, and/or uveitis. Pupils that change from miotic to mydriatic and become unresponsive to light signal brain herniation. Mid-size pupils that are unresponsive to light point to a brainstem injury, and indicate a grave prognosis. Evaluate body position and monitor posture closely—minute changes often indicate an injury that is becoming worse. Opisthotonus: Patients affected by this condition have severe hyperextension, with the head, neck, and spinal column arched. Opisthotonus in head trauma patients often indicates severe brain injury and, therefore, a grave prognosis. Schiff-Sherrington posture: In patients with Schiff-Sherrington posture, which usually manifests as thoracic limb extensor rigidity, a thoracolumbar lesion often is present. Decerebellate posture: This posture, characterized by extension of the thoracic limbs and flexion of the pelvic limbs, can indicate cerebellar lesions or herniation. Once a patient has been stabilized and assessed, and had a thorough physical examination, further diagnostics can be pursued. Packed cell volume (PCV) and total solids assess for the presence of hemorrhage. Blood gas analysis assists in evaluating ventilation, oxygenation, acid–base status, and perfusion. 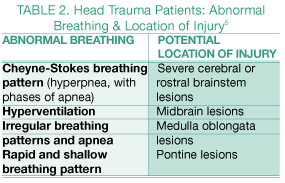 CO2 levels help monitor changes in respiratory function as a result of intracranial pressure changes or trauma to brainstem respiratory centers. Note that, currently, there is no easy, noninvasive way to measure intracranial pressure. A caloric test lavages warm water into the external ear canal. The observer looks for nystagmus; if present, it most likely indicates that the medulla oblongata, pons, and midbrain are intact. Brainstem auditory evoked response (BAER) testing detects electrical activity in the cochlea and auditory pathways in the brain; abnormal results may indicate damage to the brainstem. Electroencephalography (EEG) helps determine the integrity of the cerebral cortex and brain death. Fluids should be given throughout the course of treatment for head trauma patients. 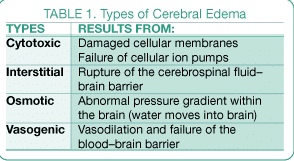 Use crystalloid fluids with caution because they can exacerbate cerebral edema. In head trauma patients, surgery can help patients that have hematomas and, sometimes, skull fractures (identified by imaging). 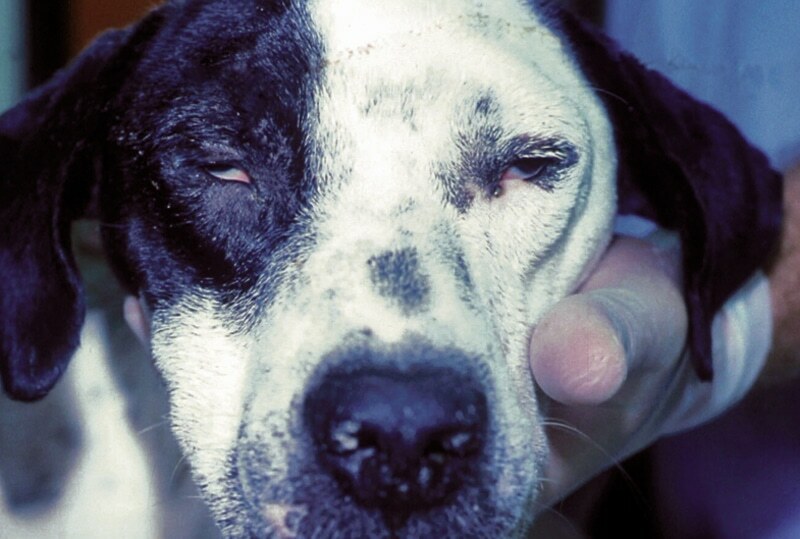 However, in contrast to humans, subdural hematomas are not the most common type of intracranial hemorrhage in dogs; instead, dogs have more evidence of contusions, which cannot be treated surgically. Patients requiring surgery should be referred to a surgeon who specializes in this area of veterinary medicine. Monitor blood pressure, which is critical in head trauma patients because hypotension results in decreased cerebral perfusion and, subsequently, brain ischemia. Beware of the Cushing’s reflex—a response to increased intracranial pressure that results in reduced heart rate and increased blood pressure. If the veterinary technician suspects its presence, the attending veterinarian should be notified promptly because a Cushing’s reflex can be a sign of imminent brain herniation. Check body temperature regularly because patients with brain injuries may have difficulty regulating their own temperature. Provide outside heat or cooling support as needed. Monitor level of awareness, pupil size, and PLR regularly. Hypovolemic patients may initially present with an overall decreased mental status. When providing IV fluids to these patients, it is important to regularly check their level of awareness and mentation. Place an IV catheter immediately after initial assessment of patients that have experienced head trauma (also discussed in Step 3 under Initial Stabilization). Elevate the cranial end of the body, not just the head, by 30 to 40 degrees, which helps decrease intracranial pressure and decreases the risk of aspiration pneumonia. If only the head is elevated, kinking the neck, the jugular veins may become restricted, causing intracranial pressure to increase. Place patients in a cage or kennel with ample bedding and rotate the patient every 4 hours to help prevent decubital ulcers. Conduct range-of-motion exercises every 6 to 8 hours to help avoid muscle wasting because these patients are unable to move normally or exercise. Treat eyes with ocular wash and artificial tear ointment every 4 hours to provide lubrication for patients that may be unable to blink, which keeps ulcers and dry eye from developing. Wipe out the oral cavity of comatose patients every 4 to 6 hours with water or an oral cleansing spray; these patients may have difficulty swallowing, resulting in saliva and debris buildup. Diluted liquid glycerin can help keep the mouth moist, while a suction machine can remove larger amounts of secretions. Express the bladder every 3 to 6 hours, or place a urinary catheter if the patient is unable to walk or stand and eliminate. Monitor urine output every 4 hours to ensure the patient is producing adequate amounts of urine. Hand feed patients every 4 to 6 hours while they are in a sternal position. If the patient is unable to swallow, consider placing a feeding tube and then administer a gruel through the tube every 4 to 6 hours.2 Avoid nasogastric tubes because they cause irritation to the nares, which may cause sneezing and, subsequently, an increase in intracranial pressure. Caring for patients with head trauma can be exceptionally rewarding for veterinary team members due to the high level of nursing care required and the strong connection created between the patient and veterinary caregiver during recovery. There is also the opportunity to share knowledge with pet owners, most of whom will be providing nursing care at home. This creates a strong bond between pet owners, patients, and the veterinary team, which most team members consider one of the most rewarding aspects of their careers. Platt S, Garosi L. Small Animal Neurological Emergencies, 1st ed. London: Manson Publishing, 2012, pp 363-382. Terry B. Head trauma. Veterinary Technician Journal 2010; 31(12). Available at https://www.vetlearn.com/veterinary-technician/head-trauma-ce. Campbell M. Traumatic brain injury. CVC San Diego Proceedings 2010. Basilio P. What to assess when triaging patients with head trauma. Vet Forum 2008. Available at https://www.vetlearn.com/veterinary-forum/what-to-assess-when-triaging-patients-with-head-trauma. Chrisman C, Mariani C, Platt S, Clemmons R. Neurology for the Small Animal Practitioner (Made Easy Series), 1st ed. Jackson, WY: Teton New Media, 2002, pp 50-54. 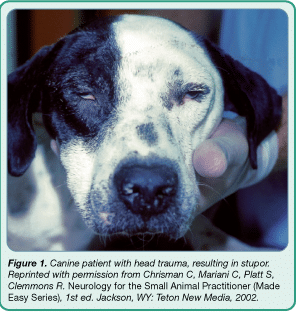 Lorenz M, Coates J, Kent M. Handbook of Veterinary Neurology, 5th ed. St. Louis: Elsevier Saunders, 2010, pp 348-352). Oriana D. Scislowicz, BS, LVT, is a veterinary technician in a neurology specialty practice in Richmond, Va. She received her BS in psychology from Virginia Commonwealth University and her AAS from Blue Ridge Community College. She is the President Elect of the Virginia Association of Licensed Veterinary Technicians.